Engraved SCARCE certificate from the Farmers and Merchants Bank of Los Angeles issued in 1874. Early certifcates from Los Angeles are very scarce. This historic document was printed by Lith. 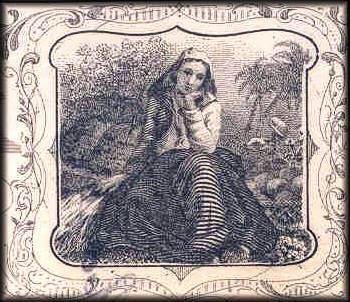 Britton and Rey, San Francisco Company and has a border around it with a vignette of a woman sitting on hay with a basket of picked vegetables on her side. This cancelled item has the hand signature of the Company�s President, John G. Downey. There is some minor ledger stain on left side and overall is in fine condition. This item is over 130 years old. 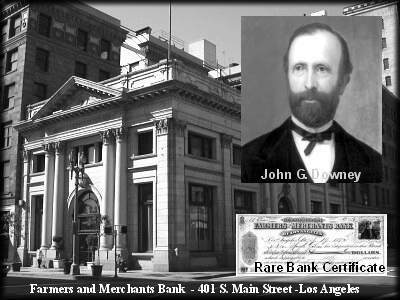 The Farmers and Merchants Bank was the first incorporated bank in Los Angeles, founded in 1871 by John G. Downey and Isaias W. Hellman, a successful merchant, real estate speculator and banker, and brother of Hermann W. Hellman. The Farmers and Merchants Bank was the oldest bank in Southern California from 1871 until 1956 when it was merged into the Security First National Bank of Los Angeles. The story of the Farmers and Merchants Bank coincides with the development of Los Angeles, particularly in the formative period from 1870 to 1900. JOHN G. DOWNEY, California's seventh governor and only foreign-born governor, was born on June 24, 1827, in County Roscommon, Ireland. He was educated in the schools of Ireland, was a druggist by profession, and in 1849, he immigrated to California during the gold rush craze. Downey became a successful businessman with interests in real estate and cattle ranching. He prospered in Southern California, where the town of Downey is named after him. Downey entered politics in 1859 when he was elected lieutenant governor of California. Governor Milton S. Latham resigned from office on January 14, 1860, and Lieutenant Governor Downey assumed the governor's office. During his tenure, work began on the capitol building in Sacramento, the Central Pacific Railroad Company of California was formed, and the first pony express rider reached San Francisco. Governor Downey vetoed the "bulkhead bill," which would have allowed a monopoly ownership of San Francisco's waterfront, and the first telegraph line was connected linking the East and the West Coasts. The Civil War started during Downey's administration, and the legislature committed the state's support to the Union. Downey left office on January 10, 1862, and returned to his business interests in Los Angeles County. Governor John G. Downey died on March 1, 1894, and is buried at the Holy Cross Cemetery, Colma, California. In 1871, with I.W. Hellman, Downey established the Farmers and Merchants Bank. Because plans had been completed to bring the Southern Pacific Railroad to Los Angeles, with branch lines out of the city, he foresaw the importance of communities along these railways. On his own ranch, he laid out a town and named the community Downey. The first home was erected there 1873. Two years later, Downey, now a prospers, flourishing city, had many homes, a hotel, two churches, a school, and a newspaper. In 1874, he started East Los Angeles, using in his publicity such slogans as "Splendid Home sites for All." Among his many other accomplishments were the attracting of many immigrants to the region, bringing in the first artesian well in the district on some land near Compton, and being one of the founders of the Pioneer Oil Company. He also helped organize the Los Angeles Chamber of Commerce (then called the Board of Trade), the second horse car line in the community, and the Los Angeles Public Library. Downey's life was saddened by a terrible railroad accident that occurred January 29,1883. He and his wife were on a southbound train that had stopped at Techachapi Station, near the summit of the Techachapi Mountains. The locomotive was detached and was taking on water when suddenly the train began to move down the slope, gained momentum, and at great speed plunged into a ravine below. The old-fashioned stoves and lamps set fire to the cars. More than 20 people died, and others were crushed and burned. Among those who lost their lives was Mrs. Downey. For years Downey suffered from nervous shock. He died in his home in Los Angeles about 10 years later.